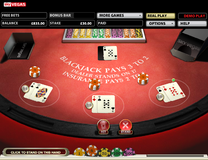 In Blackjack a player needs to get a score as near to 21 as possible without going bust (i.e getting a score of 22 or above). The player’s hands need to add up to a higher score than the dealers to win, if the dealer is higher (without going bust) they win. If the hands are level the bet is pushed/tied. Players place their bet before cards are dealt. Players are dealt two cards each, while the dealer is dealt just one card. The dealers card can be used by players to asses the strength of their hand against hands the dealer may make. Players play their hands one at a time from right to left. Each player is offered cards one at a time, with the dealing asking “stand or hit” each time. Players play to completion first by either standing on 21 or under or going bust. If the player goes bust, they lose the hand and surrender their stake. Any player standing on 21 or under remains in the game and waits for the dealer to play. The dealer must draw cards on top of their one card to score 17 or more, without going bust. If the dealer goes bust all players who stood (got 21 or under) win. If the dealer makes a hand (scores between 17 and 21) then players who stood on higher win, players who stood on lower lose. Hit: To take another card to add to a hand. BlackJack: An Ace and a 10 or Picture Card. Scores 21 and beats any other hand. If the player feels they have a strong hand, they may choose to stand on two cards. In image 1 the player on the right has a 10 and a 9, so scores 19. The dealer has an 8. Any 9, 10, J, Q, K would make the dealer’s 8 into a hand of 17 or 18. The dealer would have to stand on this and would be beaten by the player’s 19. Lower cards on the 8 would leave the dealer needing another card and risking going bust so the player is in a strong position. In image 2 the player on the right has a low hand of an 8 and a 2, 10 in all. As this hand is 11 or under no card can make the hand go bust, and every card improves the hand. In this case the player gets a third card, a 10, which makes a hand of 20 to stand on. In image 3 the dealer is showing a higher card that they could more easily make a hand from (i.e. score between 17 and 21). The player hand of 15 is not as strong as the player hand of 15 in image 3, as a result of the dealers hand. The player has a Jack and 5 for 15. Any card 7 or higher (including all picture cards worth 10) would mean the player goes bust and loses the hand. However the player may decide to take the risk and hit to try and improve their hand. If the dealer was on a lesser card the player may protect their hand from going bust by standing hopeful of the dealer going bust. If a player has a low score after 3 or 4 cards then they can keep taking cards. In image 4 the player in the middle has Ace, 3, Ace which can count as 5 or 15. This hand could also count as 26, however as the Ace is 1 or 11 it suits to treat one or both of these Aces as 1’s. No card can make them bust, and every card will improve their score. 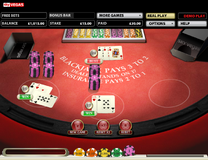 Image 5 shows a player going bust. In this case the player had a K and 2 for twelve. By hitting there was a risk of going bust, and the Q makes the hand 22. This means the hand is lost regardless of what the dealer’s hand ends up being. In this case the dealer has 15 so would need to hit again, but as the player is already out the hand is not finished. In image 6 the players on the right and middle had 16 and 15 and stand on their hands. Hitting would have carried a risk of going bust. As the dealer was showing a 5 this could not make a two card hand, and meant the dealer was more likely to go bust. The players decided not to risk hitting and stood, hoping the dealer would go bust. This is also discussed in image 3. The dealer does go bust from this and all the hands are winners, despite being will under 21. If the player stands on 21 or under, and the dealer makes a hand between 17 and 21, then the hands are compared. The highest score wins. If the player and dealer get the same score the bet is pushed, so the stake is returned to the player. In image 7 the player hits twice to make a 20 from 4 cards. The dealer is under 17 from the first 2 cards, so has to take a 3rd. This gives a 21 which beats the player and means the stake is lost. 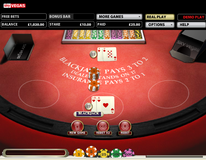 Image 8 shows two hands of Blackjack being played by the same player. The player has a 15 and a 19. The 15 was not hit on, however the 19 was made from taking 4 cards. The dealer plays and scores a 17. This means the hand on the right, which stood on 15, loses. However the hand on the left which on 19 wins. When a player’s first 2 cards total 9, 10 or 11 they player is given the option to double their stake. When doubling the player can only take one more card, this is often placed sideways on to indicate no more cards allowed. If the player decides not to double they can then hit again and take a 4th card if they wish. Image 9 shows the hand on the left with an 8 and a 2 making 10. Players will generally double as this gives an advantage in most cases. If the player is ‘behind the dealer’ they may decline doubling and keep hitting for their original stake. For example if the dealer had a 10 and the player had a 4 and a 5 doubling on the 9 would be unwise, as the 10 is a strong card for the dealer. Image 10 shows the double down being played on the 10, with a 9 drawn giving the player 19 in all. The dealer goes bust on 24, which means the player gets their stake and their double down matched. This means the player won double the money they would have done had they not doubled down. When a players first two cards are the same, the player is given an option to split the cards. This is offered on any cards and is particularly appealing on low cards like 2’s and 3’s, and high cards like aces and tens. As with doubling down the player needs to match their stake with another bet. This bet is used to pay for the second hand. When splitting the cards form two different hands. 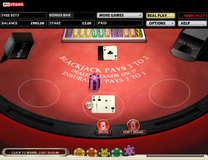 Image 11 shows the dealer being dealt two 4’s. As with doubling down the player can opt not to split, and play as a normal hand. 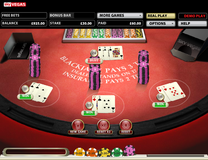 In this case the player can hit or stick on 16, or double the stake and play two new hands hitting on the two the 8’s. The dealer’s card will shape this decision, as will the cards to be split. For example low cards may be better used to hit as one hand (two 5’s will more often be doubled on than split). Higher cards may best split, so two 9’s may be split to try for two high two card hands. If the dealer has a strong card like a ten or ace this may put players off splitting, as it involves putting more money in. In the case of the 9’s the player may opt to stand on 18 anyway as it is high, whereas splitting could leave two lower hands. Most forms of Blackjack pay 3/2 on Blackjack. This means if the player gets a ten (10 or any picture card) and an ace they will get 1 ½ times their stake. So for a £10 bet, £15 profit will be returned (see image 12). Provided the dealer is not showing a ten or ace the dealer will pay out Blackjacks before dealing any more cards, as those hands cannot lose or push. If the dealer is showing a ten or an ace then they will wait and see if they have Blackjack. If they do the Blackjack hands will push. If the dealer is showing an Ace then players are offered an insurance bet as shown in image 13. This involves betting half the stake on each hand on the dealer making Blackjack with their Ace. The odds paid out on this are 2/1. This represents a poor value bet as the odds on getting a ten are outside 2/1, however players with strong hands worried about being beaten may opt to do this. 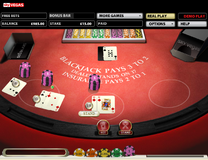 If the player has Blackjack they are offered even money (as opposed to 3/2 for their Blackjack). This takes less money than the Blackjack may be worth, but takes out the risk of the dealer getting Blackjack and the hand pushing.